Are We Becoming a Nation of 'Free Riders'? Usually the term free rider is defined in the context of a public good. An individual is a free rider who is reluctant to contribute voluntarily in the provision of a public good. All people consume a pure public good in the same amount, and it is not probable to exclude others from its consumption. National defense is an example of a pure public good. The free rider problem could arise in a common property resource such as public pastureland and forestlands, public waterways and clean air. It could also arise in the provision of private goods, such as the electricity grid, when some individuals hook up to the system without paying. Such cases arise due to large detection and enforcement costs in eliciting payments. Hence, in large group settings, it is necessary to use enforcement mechanisms of taxes and/or user charges with the force of the law. Estimates developed by the IRS show that Net Tax Gap (NTG), tax liability minus taxes neither paid in time nor collected, increased from $290 billion in 2001 to $385 billion in 2006. NTG was 85.5% percent of the Gross Tax Gap that comprises only taxes not paid in time. Tax evasion occurs when one fails to report income or claims more than the legally allowed deductions. The underreporting gap on individual income taxes, corporate taxes and employment taxes is close to 98 percent of the NTG. IRS report Tax Gap for Tax Year 2006, Overview, January 6, 2012, found that "More than a third of the growth in the underreporting gap was attributable to corporate income tax." (www.IRS.gov). 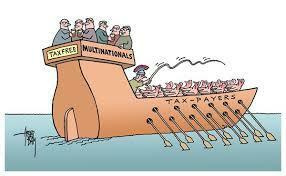 These tax evaders are free riders, as they benefit from public goods and services. I am sure there are many minor free rider issues that are not cost effective to be resolved. However, when large amounts of revenue loss is involved or large groups are involved, it could impose a heavy cost on the nation. Joel Slemrod and Jon Bakija (SB) in their book Taxing Ourselves (2008) argue that tax evasion creates horizontal inequities, since equally well off people share different tax burdens. Tax evasion deprives the government of revenues that could have been used in the production of public goods, such as infrastructure, cleaning up the environment or more spending for education and training programs. Tax evasion, if pervasive due to lack of monitoring and enforcement, may necessitate higher tax rates, thus causing further evasion and loss of productivity and income. Tax avoidance by businesses and individuals, though legally sanctioned, increases vertical inequities since large corporations and wealthy individuals have resources to hide their profits and/or incomes in offshore tax havens. In a study Picking UP the Tab 2013, Phineas Baxandall and Dan Smith, April 2013, found annual tax revenue loss of $150 billion in 2012 from tax havens. Authors estimate that if this extra annual loss of $150 billion "was distributed evenly among all taxpayers, in 2012 each American taxpayer would pay an additional $1026" to offset the loss. Such tax avoiders are legally sanctioned free riders. A particular free rider problem, recently reported in the media, caught my attention. Certain ranchers in Utah and other Western states claim that BLM (Bureau of Land Management) and USFS (US Forest Service) are interfering with their rights to use public lands for grazing their livestock. BLM and USFS require permits and user fees from ranchers for grazing rights on public lands. Cliven Bundy, a rancher in Nevada, supported by armed anti-government groups led by his son David Bundy, refused to pay long overdue grazing fees for his cattle on public lands managed by BLM. In order to avoid violence, law enforcement officers withdrew from the ranch without collecting fees. But, finally Cliven Bundy was arrested recently when he was involved with armed occupiers of a wildlife refuge in Oregon, headed by his son Ammon Buddy. Many other armed men involved in standoff in Nevada and Oregon, including David Bundy, were arrested and indicted for criminal acts. BLM and USFS manage most of the public lands, and most of the land is in 11 Western states. These rebellious ranchers claim the right to use public lands free of charge. The data from The Center for Biological Diversity (CBD), January 2015, show that grazing fees that have been declining since 1991 adjust with the cost of raising livestock and the market price of livestock and were only 6.72% of the private grazing user fees on private lands. Hence, all ranchers who use public lands are already obtaining large amounts of taxpayers' subsidized benefits to earn profits. However, these rebellious ranchers would like to obtain extra subsidy from taxpayers, including other law-abiding ranchers. The rise in the ratio of unreported income to reported income to IRS since 1985, as shown by estimates developed by Professor Edgar Feige, and public lands' grab by some ranchers with tacit support of some politicians, are indicative of a developing culture of free ridership. This culture is corrosive to the economic system. It creates a contagion effect when law-abiding taxpayers notice some others not fulfilling their responsibilities to the society. Research shows that dishonesty and honesty are contagious. Leaders, who either directly or tacitly encourage free riders, contribute to the contagion effect and hence undermine lawful functioning of the society and nurturing of trust in the state. Mathur is former chair and professor of economics and now professor emeritus, Department of Economics, Cleveland Sate University, Cleveland, Ohio. He resides in Ogden, Utah.